Lily has perfected the art of being invisible. For the past two years she hasn't spoken to anyone or looked anyone in the eyes. Everyone thinks she's brain damaged. But Lily has a secret. A secret she's never told anyone. One day a new girl, Tinny, shows up in town and discovers one of Lily's secrets: she's not brain damaged. And Lily knows right away that Tinny is trouble. Lily has read every Nancy Drew book in her school's library and she considers herself to be a pretty good spy. Plus, since people tend to look right past her, she notices things that other people might miss. Lily decides to keep her eye on Tinny and find out what the deal is. Tinny is hiding something. Just like Lily's hiding something. And if they can find the courage to tell, they just might find forgiveness. For me, this book had the perfect buildup of suspense. I was hooked right from the beginning when I found out that Lily was hiding something. It takes awhile to find out exactly what happened to Lily two years ago, but the climax was not disappointing. It was a little heartbreaking, actually. I love the portrait of small-town Illinois. The quirky characters of Fern, Miss Pearl, and Miss Opal really gave the book flavor and even some comic relief. The book has a sort of timeless quality. It could be three years ago (at least that was when the cicadas swarmed southern Indiana) or it could be twenty years ago. I guess my one quibble is that Tinny's story didn't quite sit right with me. I loved her and her trouble-making ways until we got to the end and learned what Tinny's secret was. I'm not sure why, but it didn't seem realistic. I loved Lily's story and the unfolding of her secret. And I get that Tinny's secret brings the girls together and instigates the action at the end of the book. But it just didn't ring true to me. I don't want to spoil anything, so I'm not giving specifics... Those of you who read it, what do you think? I'm hearing Newbery buzz about this one and I think it makes a fine contender. See other reviews by Jen and Shelf Elf. It's been listed for the Anokaberry, ACPL's Mock Newbery, and one of Joanna's favorite books of 2008. 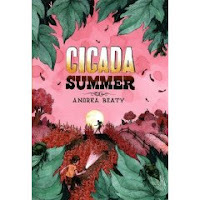 Be sure and check out Andrea Beaty's website and Three Silly Chicks where she blogs about funny books for kids. I agree on Tinny's plotline. It seemed very "gee willikers!" to me after what was largely a sweet and pensive story. Overall, though, I still came away with a good feeling about the book!